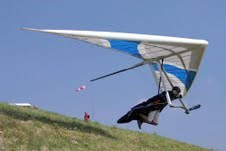 Rich Lovelace ~ hang gliding: Will he or won't he fly? So the controversy has started – those of you following Jamie’s blog will have read today’s post Helmets & Shoulderpads ……….. The hot news tonight is that Gerolf might not fly The Worlds due to the ‘helmet’ issue. Hope the problems can be overcome – won’t be the same without him.